Saturday 6 April will be International Social Circus Day. From Kiss a Ginger Day to National Peanut Butter Day, at the moment it feels like there’s a day for everything – but this one is particularly special for us. Our Engagement Manager Roisin Walsh reflects on the past seven years of circus in the north London community and looks towards the future as we begin to expand our building, and our horizons, for using circus as a tool for social change. Social Circus as a practice has its roots in Cirque du Monde, a 25-year-old concept practised in Latin America even before the French coined the term. Social Circus exists as a means to use the transformative powers of circus as a catalyst for social change in deprived areas and isolated communities. While the movement is about teaching circus skills, its primary focus examines how participants are empowered to be open-minded, develop trust between others, renew their self-esteem, find a sense of balance and coordination in their lives and build positive support networks in their community – all of which prompts social mobility and change. Julieta Infantino, from Circo Social Del Sur in Argentina, says circus artists have “found in social circus an innovative way to combine their artistic interests with their desire to transform inequalities and social problems affecting different social sectors, especially disadvantaged children and young people”. Since then, the practice of social circus has spread worldwide and been adopted by companies such as Galway Community Circus in Ireland, Sorin Sirkus in Finland, and Phare Ponleu Selpak in Cambodia. And it isn’t just young people: companies such as Upswing are also looking at how they can use circus as a tool to challenge perceptions working with older people, too. 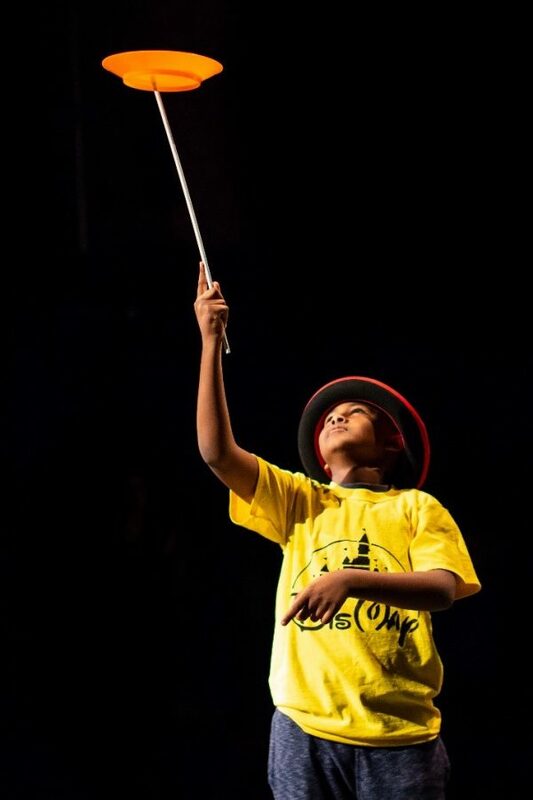 JL Circus has been running in Haringey for seven years, funded by Children in Need; more recently, John Lyon’s Charity has funded sessions in Barnet for the past three years. Haringey in particular has some of the most acute social challenges of all London boroughs: it is the sixth most deprived borough in London, with sixty-one percent of children in low-income families. JL Circus participants work with professional circus practitioners – developing skills such as hula-hoop, stilt walking, acrobatics, juggling, storytelling and more – in their communities, while having fun and developing friendships outside of their school environment. Most participants are within walking distance of sessions and session content is led by both the practitioner and what skills participants are interested in learning about. 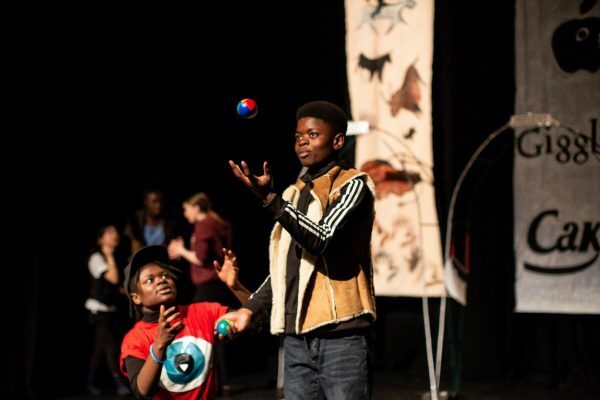 The most fundamental aspect of the sessions is that they’re entirely free and that we bring the work to them; in that way, we break down barriers for participants from deprived areas to help them get involved and become empowered by the circus skills that they are learning. Every year, Jacksons Lane hosts an annual Spring Showcase in which our Haringey groups get to display the skills they have been developing over the year to their family and friends on our stage. We give the showcase a budget and employ a professional production team to support our groups in presenting their creative work onstage. 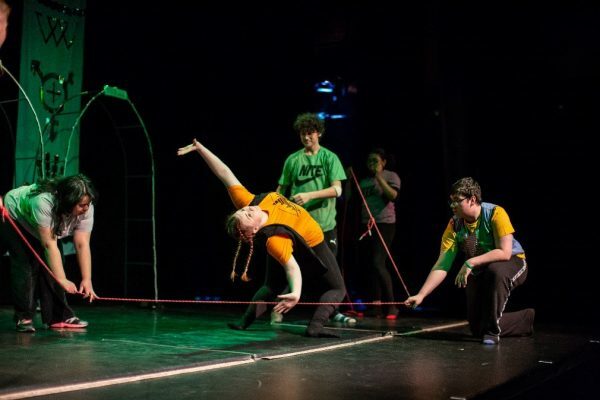 Comments from our young people reveal that they find the time leading up to the showcase develops their teamwork and communication skills, that they feel stronger both physically and emotionally for participating, and that they would describe JL Circus a family unit outside of school. All of these things are elements of personal growth that can support a young person as they approach various crossroads of life-changing decisions in their lives. Parents have also commented that their children’s participation has led to a sharp increase in their confidence to try new things and the ability to process mistakes more constructively. Mistakes are a part of life: this is something that, through learning circus skills, young people can learn to process through trial and error, in a safe and supportive environment. You can watch some of our JL Circus participants in action on Blue Peter here. The Together Project is a funded project by City Bridge that works through the arts to support the well-being of older people and people living with dementia in Haringey. The project includes creative workshops delivered by partners Spare Tyre at Haynes Dementia Hub and fortnightly Broadway Brunches, which tour Homes for Haringey supported housing schemes. “Through introducing circus to Broadway Brunch guests, I have learnt that circus can be for everyone and is accessible. Circus artists have led circus exercises with both scarves and balls. Guests have held back when first offered to have a go but then suddenly the whole room is juggling scarves in delight. This works for both seated guests and is adaptable for varying levels of mobility. Two of our guests who are registered blind were also able to juggle the scarves as they could see the shadows. I have witnessed a huge sense of self-achievement for all. Women Rise, a project funded by the Tampon Tax Fund, runs a series of events in sheltered housing schemes and community spaces across Haringey, with the aim of increasing physical, social and mental well-being for women over 55. As well as this, it aims to increase the knowledge of services available for women in the borough by working in partnership with Haringey Council, Solace Women’s Aid and Victim Support. One of the ways Women Rise aims to empower women is through Silver Circus workshops. The content of these workshops range from scarf juggling to hoop exercises, all adapted to suit the needs of the participant and their physical range. Participants have commented that Silver Circus activity has increased their sense of coordination, balance and, through meeting other women in the local community, has reduced feelings of isolation and loneliness. As well as the opportunity for women to participate in circus activity, Women Rise also creates a safe space for women to discuss issues pertinent to them where they may not otherwise be able to do so in other spaces. In this way, we support our local community to build positive support networks through participating in circus activity. Jacksons Lane has some incredibly exciting plans for the future life of our Creative Learning work. Having just secured three more years of funding from Children In Need for JL Circus, our plans include allocating some of the funding to our Youth Board to run their own creative projects. At the end of April we’re also hosting some free Silver Circus workshops at the Tate Exchange. And in the short term, at the time of writing our upcoming Broadway Brunch next week is circus-themed! Jacksons Lane is currently gearing up to a capital project at the start of 2020, at which point we’re planning to close our main building for one year while we renovate and expand our creative spaces. But the work doesn’t stop when the doors close; the Creative Learning team will still deliver our socially-driven circus activity out in the community while busily planning for the shape of things to come when our doors reopen. With a bigger building comes bigger ambitions, and a bigger capacity to make an impact in the community... watch this space! You can follow our Creative Learning activity on Twitter here, read more about our social impact in the community here, and donate to support our work at Jacksons Lane here.